Micro Analog Systems Oy introduces new smaller 2 x 2 x 0.5 QFN package for MAS6240, a piezo driver IC designed to create a multi-tone sound. It is a high efficiency, easy and low cost IC for wrist watches, alarm clocks, GPS, PDAs and other handheld or portable solutions. Traditionally multi-tone sound has been implemented using an external inductor for each different output frequency. This has been solved with a new design also giving a wider audio bandwidth. The inductorless design causes significantly less disturbance to the surrounding circuits, making it an ideal choice for sensitive designs. Only four small value capacitors are needed in addition to a sound element. MAS6240 can also be used in other applications for example as a white LED driver. 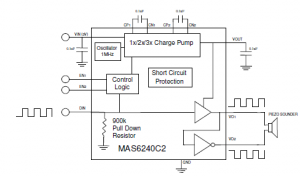 MAS6240 can drive outputs up to 18 VP-P from single 3 V supply voltage. An input voltage amplification factor can be selected as 1, 2 or 3. The output can be selected as a single mode or a differential mode. A sound signal is feeded in a digital form. The digital sound signal also controls audio and shutdown states, so additional power on control is not needed. A shut down current is less than 1 ?A. The chip is available in 2 x 2 x 0.5 as well as 3 x 3x 0.75 mm 12 pin QFN packages and also as EWS tested wafer. Samples are available. Price for a QFN packaged device is USD 0.57 (3 000 pcs).